last night we had a family friend over for dinner. since we knew that it was going to be a hot and humid july evening, we decided to make a slightly adapted version of our grilled bbq chicken pizza along with a side salad for dinner. easy peasy. for dessert, we wanted something that was impressive yet fuss free. 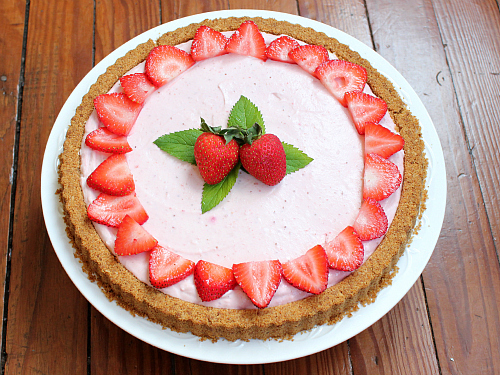 so, the night before our dinner guest came over, we threw together this strawberry mousse pie. this dessert was so easy to put together. it required minimal baking time (perfect for the summer) and was able to rest in the refrigerator overnight until we were ready to serve it the next day. now that right there is smart entertaining. the pretzel and graham cracker crust was the perfect combination of sweet and salty. who knew pretzels would be such a hit in a crust? now, we're hooked. ryan and i have already started to dream up our next dessert creations using pretzel crusts. 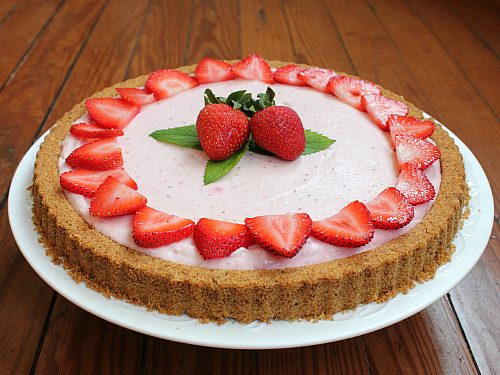 the crust really balanced out the strawberry filling. the filling was the consistency of mousse. light and fluffy whipped strawberry heaven. it was decadent, yet it wasn't sweet at all. our dinner guest was equally impressed by the presentation and the taste of this dessert. if you are looking for the perfect summer dessert to wow someone, look no further. this recipe is a keeper for sure. to make the crust: use a food processor to grind crushed pretzels and graham crackers into fine crumbs (yielding 1 cup of pretzel crumbs and 1 cup of graham cracker crumbs). in a large bowl mix together the pretzel crumbs, graham cracker crumbs, and brown sugar. stir in the melted butter until all of the crumbs are evenly moistened. press the crumbs into the bottom and up the sides of a 9 or 10 inch tart pan or pie plate. bake for 10 minutes. once baked, remove the crust from the oven and place it on a wire cooling rack to cool completely. to roast the strawberries: spread the sliced strawberries out evenly over a baking sheet lined with parchment paper. sprinkle the strawberries with 1/2 teaspoon of granulated sugar. bake for 20 minutes. remove from the oven and set aside to cool completely. 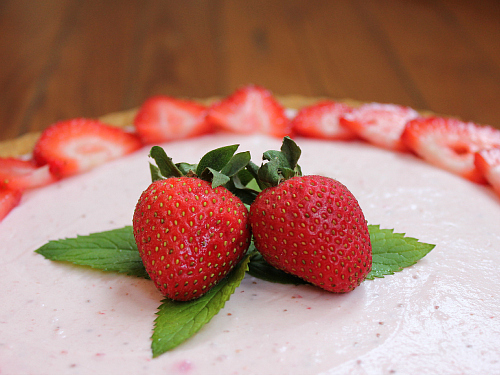 once the roasted strawberries have cooled, puree them in a food processor or a blender. to make the filling: use an electric mixer to beat the softened cream cheese until soft and smooth. add in the remaining 1/3 cup of granulated sugar and the vanilla and beat well. add in the pureed roasted strawberries and beat well. set aside. in a separate bowl, combine the heavy whipping cream and powdered sugar. whip with an electric mixer until stiff peaks form. do not over beat. carefully fold the whipped cream into the filling mixture, 1/3 at a time, until it is completely incorporated. scoop the filling into the cooled crust. refrigerate for at least four hours before slicing and serving. serve cold with additional strawberries and fresh mint leaves for decoration. I second that motion. It looks absolutely delicious! This pie is beautiful! It should be in a magazine! I will have to give that recipe a try.